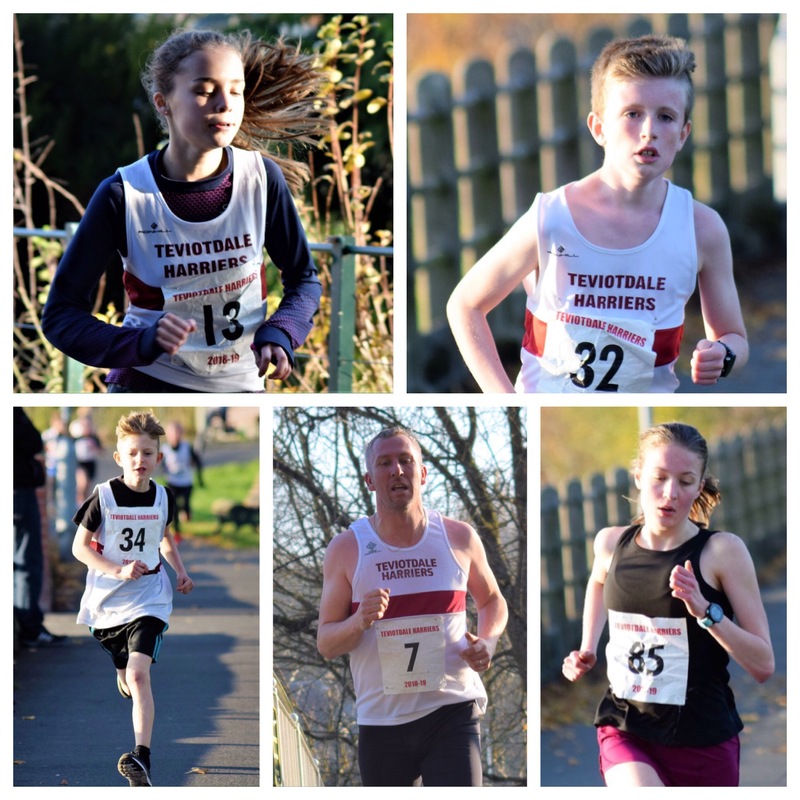 Fifty Teviotdale Harriers each gave their very best in the annual Burns Club Races on Sat 17th November on a beautiful sunny afternoon in Hawicks glorious Wilton Lodge Park, writes Paul Lockie. Five Trophies were up for grabs, across three courses each starting near to the Burns Club. The Burns Club have kindly sponsored this Harriers event for over 50 years. First race off were the men with veteran Frances Cannon first away for the Will Clark Memorial Trophy. However the race belonged to Gregor Welsh who raced his way through 6 front runners to find himself first across the line after 2.4 miles to take the trophy. Next to run were the under 13 girls and under 11 boys with 12 young Harriers proudly lined up at the start line for their 1.1 mile course. The race was competitively fought with the first 5 runners crossing the finish line within about 10 seconds of each other, but it was young Lyle Beattie first across, picking up the Iain Watson Memorial Shield and Iona Jamieson first girl lifting the Stan Reid Trophy. The last race of a great afternoon had the largest field of runners with 20 Harriers taking on the 1.9 mile course. In another closely fought race Robert Wood finished first to pick up the coveted Burns Club Trophy , closely followed across the line by Eilidh Jaffray who took the John Elliot Trophy. Afterwards runners, families and supporters crossed to the Burns Club and enjoyed superb hospitality and presentations kindly awarded by Burns Club President Alec, with a special appearance of Andrew Oliver to award the Burns Club Trophy. Andrew had lifted the same trophy some 50 years earlier in the same venue. The fastest runners on the day for the 3 courses were Colin Welsh in 13:08 in the gents race, Fraser Clyne in a very impressive 10:04 on the 1.9 mile course, and Iona Jamieson 6:52 on the 1.1 mile junior route. Huge Thanks to the Burns Club for their sponsorship, Burn Club President Alec and Andrew Oliver for presenting the trophies , everyone who helped on the day and all the supporters who cheered and encouraged the runners. The next club race in Teviotdale Harriers calendar is the Menzies Race on Saturday 22nd Dec.